Built in 1906, the ABC Sound Broadcasting and Television Studios on Adelaide Terrace are a typical example of the Post-War International style. 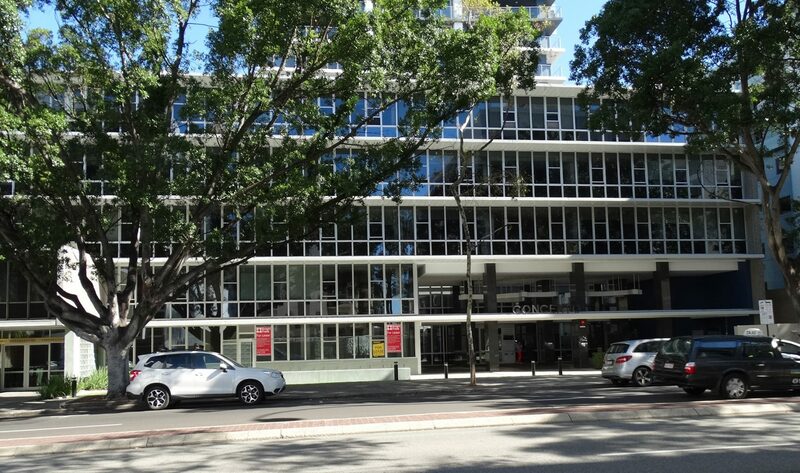 Most people will associate the building with television, radio and as being the former home of the West Australian Symphony Orchestra. Renowned West Australian artist Robert Juniper was commissioned to create a broadcasting-themed mural for the ABC, which remains in situ at the entrance to the place. More intriguingly, though, it also contains the Basil Kirke studio, named after a former manager, which is said to be based on the famous Abbey Road studio where the Beatles recorded in London. The 10-metre-high studio was the first major in-house ABC sound recording studio in Australia. With its superior acoustics, created by the physical space rather than just added at a mixing desk, it was one of the finest studios in Australia for many years. The Oscar-winning soundtrack for the film Out of Africa was recorded there. The West Australian Symphony Orchestra (WASO) used the Basil Kirke Studio for rehearsals, recordings, broadcasts and concerts from the time the studio was constructed until the orchestra was relocated to the Perth Concert Hall in 1973. After the ABC left the site for new offices elsewhere in East Perth, it was decided to retain the façade and the studio, while a 38-storey apartment tower was constructed behind.